René Magritte was not particularly skilled at rendering. The anatomy of his figures is a little bit awkward. His rendering of light and shadow are slightly inaccurate and clearly not done from observation. To the untrained eye, for example someone who doesn’t know all the rules having to do with traditional painting, his paintings are satisfactory but not completely realistic. Magritte’s paintings are clear and understandable representations of things that he is rendering, for example an apple looks like an apple, and a pipe looks like a pipe. If you were to compare Magritte’s paintings to earlier artists, such as Jacques Louis David’s painting of Madame Recamier, David’s paintings are more realistic and convincing. A viewer might even think that David is a more skillful painter in his rendering of light and shadow, his handling of paint and brushwork and the accuracy of color. 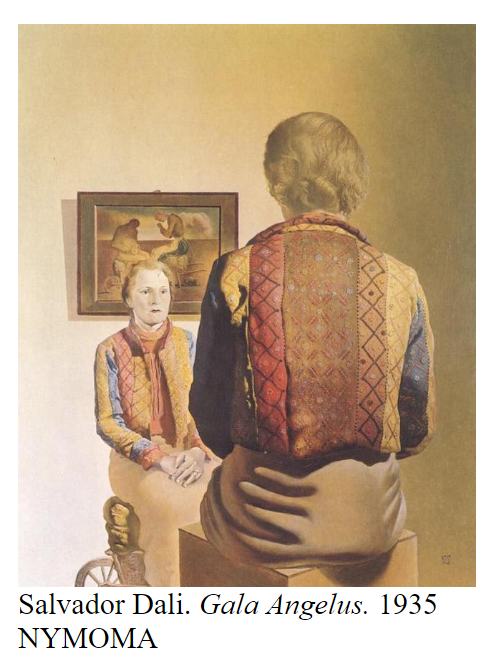 Even when compared to the paintings to a peer of his, Salvador Dali, René Magritte’s paintings come in a close second in terms of how believable they are. However, compared to some other Surrealists such as Frida Kahlo, and Marcel Duchamp, René Magritte’s work appears to be more realistic than these others. The reasons why I bring this up is not to detract from René Magritte’s reputation as an artist but rather to reinforce the idea that René Magritte’s paintings are more about the content or subject matter of surrealism than they are about the traditions of making beautiful or realistic oil paintings. So why didn’t Magritte learn to paint like David and or Dali? The answer is that it wasn’t important to his art. It’s kind of important to note that artists like Marcel Duchamp and his contemporaries were not very concerned with artistic technique. These artists, which is very common at the beginning of the 20th century, were more concerned with the meanings behind their paintings than they were with the paintings being a pleasing aesthetic experience. The concepts behind artistic work were more important to many of the early 20th century artists than the actual “look” of the paintings. In contrast to this, the Impressionists from the middle of the 19th century were very concerned with how their paintings looked but not very concerned with what the paintings represented. 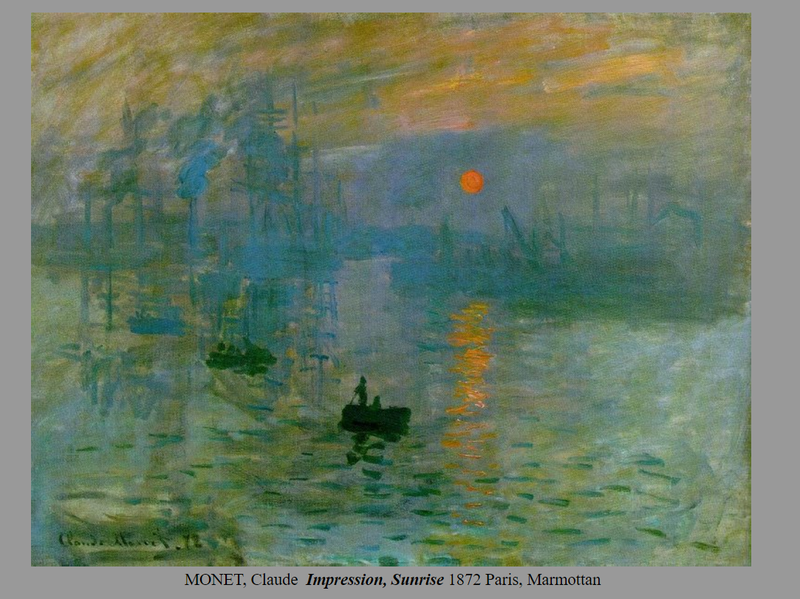 The Impressionists were interested in depicting optical effects of color and colored light. Their work was considered groundbreaking and broke with earlier traditions by focusing on the physical characteristics of the paintings and especially with the experience of seeing things and giving the viewer an impression of that view. In contrast to the Impressionists since they had already dealt with color and physical properties of painting as the subject matter painters of the early 20th century began to focus more on concepts and ideas expressed by their art. 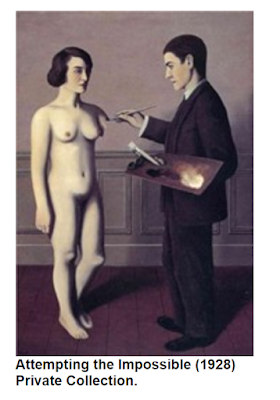 René Magritte lived during the time that psychoanalytic theory was the giving to be developed. Sigmund Freud and Carl Jung developed theories of how the human mind was constructed and the importance of dreaming and the symbols that happened in the unconscious or dreaming mind. 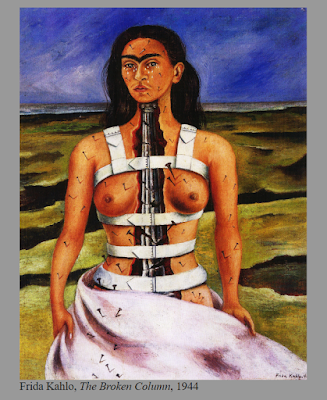 Many of the “movements” and styles of art were heavily influenced by the development of the science of psychology and artists attempted to work with these theories in their paintings. In this way, the subject matter of most surrealist art is the human mind and how it worked. 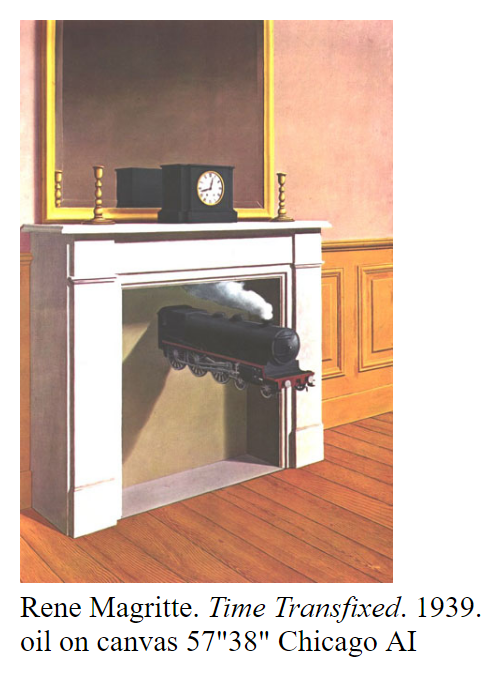 Another reason why Magritte wasn’t that interested in rendering or exacting realism is probably because he trained initially as a commercial artist and most of his work was designed to be printed rather than the one-of-a-kind original works of art. Some sources about Magritte discuss in making posters and children’s books. In every way, Magritte’s first concern with either his commercial art or his so-called “fine art” Magritte was interested in communicating ideas first and making beautiful images second. So the elements of form for most early 20th century artists are less important than the ideas that motivate making the work of art and this is especially true for René Magritte. One of the things that comes together and probably helped agreed to focus and communicate his ideas about psychology more clearly is the use of captions and text in the commercial posters and books he designed and illustrated. In fact, even though Magritte was selling his work he wasn’t selling enough of his fine art to stop making commercial art until 1927. This probably accounts for his use of text or words in his fine art paintings. In order to understand the subject matter of Magritte’s paintings you have to first understand one of the first concepts developed by Sigmund Freud about how the human mind works. Freud coined the term “cognitive dissonance.” A simple definition of cognitive dissonance is the ability of a person to hold to ideas in their mind that are in opposition to each other at the same moment. For example, authors sometimes referred to the “Willing suspension of disbelief.” What this means is that when were watching a play or a movie or reading a book even though we know the book is not realistic or the images are not believable we willingly believe they are in order to enjoy the work. Freud thought that this was particularly interesting that we are able to understand the difference between fiction and reality. Furthermore, Freud and Magritte probably would agree that this ability of the human mind to hold onto the idea of reality when we are engaging with the work of fiction or illusion is interesting. In this painting, roughly translated from the French as “the treachery of images,” for us it would probably the best translated as “paintings are not the same thing as reality.” In this painting, which Magritte made over and over again throughout his life, we see the image or an illustration representing a tobacco pipe, underneath the illustration or illusion of a pipe we see the words “this is not a pipe.” In French. 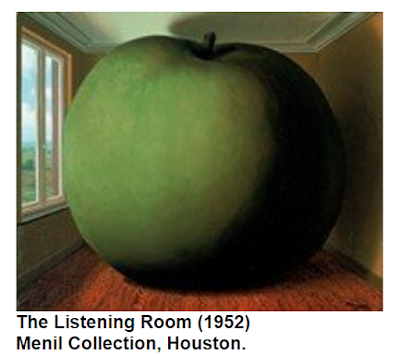 Basically, Magritte is captioning his picture in the picture. The caption is telling you not to believe that this is a real pipe but just a representation of a pipe. These are two opposing ideas, because a lot of times when we look at a picture we want to accept the idea that what we see in front of us is a real thing and we don’t bother with acknowledging the idea that it’s just an illusion or a fake representation of something from the real world. Magritte likes to do this in many of his paintings. He provides us with a premise or an idea that something is convincing or accurate and then he provides another kind of idea in the painting that’s the opposite of what we see. 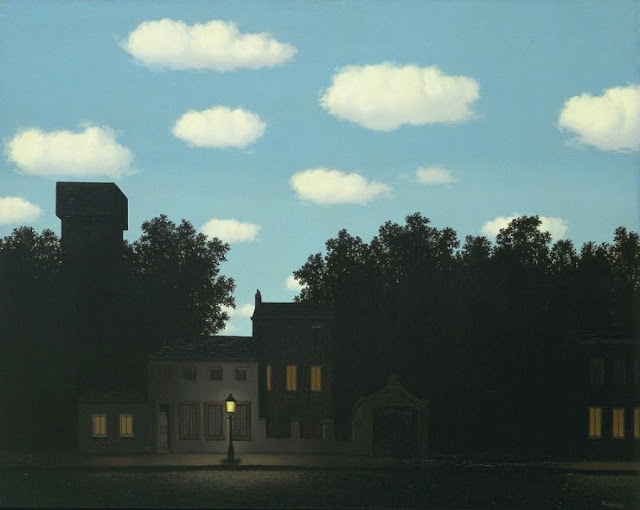 For example, Magritte will show us a street at night but the sky above it is a daytime sky. We know that it’s a street at night because we see a street light and lights in Windows and on lamp posts but, we couldn’t see these lights with a daytime sky like that. So basically, René Magritte is always making paintings that deal with the fact that humans are capable of understanding that what they are looking at is not the real thing but our imaginations allow us to pretend that it is.